Shipped by Newegg.com (SBN) is a fulfillment service that is both efficient and price-conscious. You may want to use the buy shipping labels from Newegg feature for Newegg orders instead of SBN. After this setup is done, you can start to create SBN shipments. Go to Settings > Warehouses > click Add New Warehouse. Enter a Newegg warehouse name, and in the Type dropdown field, select Newegg > click Save. To map the warehouse, go to Company Settings > choose the company > Toolbox > click Channel Warehouse. At the bottom of the page, click the SBN field and set the value to this Newegg warehouse name > click Save Settings. Go to Inventory > Newegg.com Inbound Shipments > click Create new Shipment. Choose the Company to create the shipment for > enter the shipment Description > click Continue. 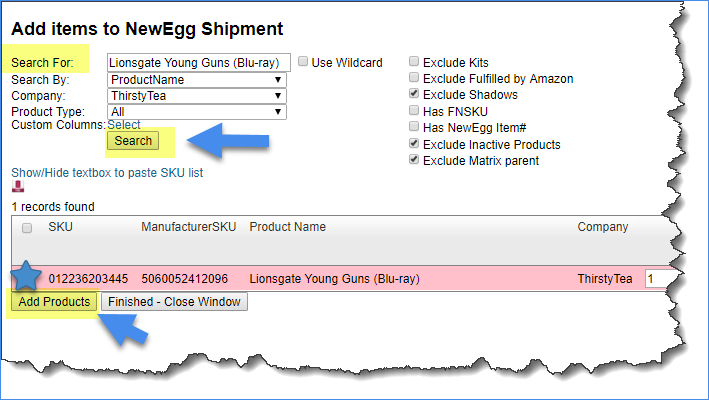 On the new Shipment # page > click Add Items. In the Add Items to Newegg Shipment window > use the Search For field to find the item for the shipment > Search. Select the product > click Add Products to add the item to the shipment. On the Shipment page > click Action Menu > Preview > Go. This action shows the destination address and the shipment status as "Previewed." Click the box icon to open the Manage Boxes page > enter dimensions/weight of the package to send to Newegg > click Update. Click on the Shipment # to open the shipment > click Action Menu > click Ship Items > Go. On the Ship Items page > choose the Shipping Method and Shipping Carrier for the shipment to Newegg SBN > select the package > click Ship Items. On the Shipment # page with a Shipped status > click Action Menu > Download Labels > Go. Click Re-Get Labels from Newegg to generate a shipping label for the package.